After reading Bea Johnson’s book of the same title, I realised that what we’re currently doing isn’t enough. We thought we were eco-friendly, but turns out we’re not. It’s just not enough to recycle, take bags to the supermarket and our Keep Cups to the coffee shop. 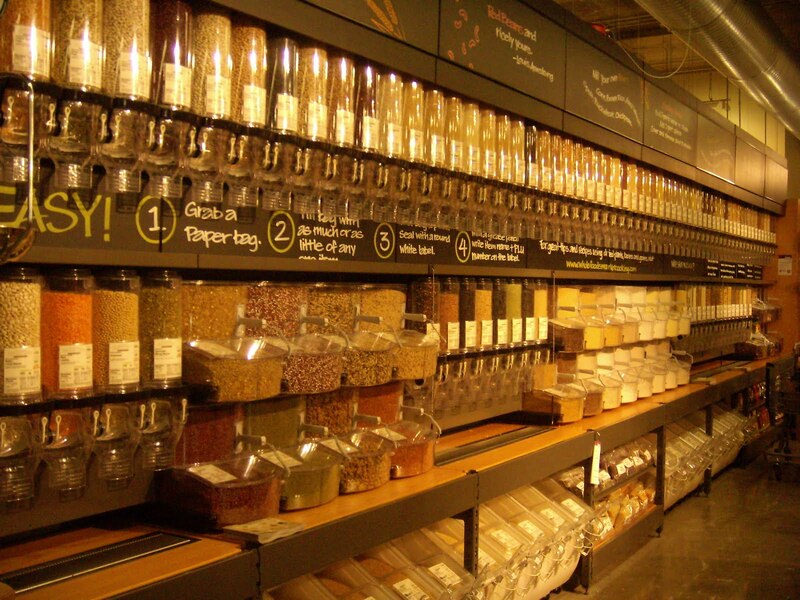 Bulk shopping is fun – and who said there’s no choice!? Now I feel silly not to have made these changes earlier (years ago, in fact). Located a bulk store. Yes, there was one nearby, but we just never looked for it. Now most of what’s in our pantry comes from the bulk store: Pasta, rice, quinoa, dates, beans, pulses, flour, nuts, tea, coffee, herbs & spices and cereals. They also sell glass containers but we had quite a few from products we had bought in glass jars at the supermarket (olives, tomato sauce, etc.). Herbs and tea go into our old containers we bought at the supermarket once they’re empty. Found an organic farmer’s market. Again, there was one within walking distance but even though we’ve been living in the same spot for over a year, we never went. The market has all our veggies, fruit and bread. We also buy eggs, olive oil and olives there and are able to return the containers for re-use to the market stall. Looked at what’s in the bathroom. I realised that we can buy shampoo, conditioner, body lotion, facial moisturiser and unwrapped soap at the bulk store. They also sell coconut oil which I use on my skin. We now use a crystal stone deodorant (which lasts a few years). Removed bins from all rooms except the kitchen. Having bins in the office and bathroom just encourages waste production. Oranges and onions sold in nets. Apples in plastic bags. Other fruit in plastic trays, wrapped with plastic all around. Vegetables sealed to keep them apart from the non-organic ones at the supermarket. All other packaging for rice, pasta, flour…. We eat fruit instead of buying bottled juice. Long ago we had switched to tap water instead of bottled water. Refuse: receipts, napkins, brochures, “free” items such as pens or hotel toiletries (because of the cost to the environment), paper bags provided at the supermarket’s self-serve bakery section (these 2-3 items can be carried by hand). Reuse: pretty much everything. If it cannot be reused, the rule is to refuse it. Awareness: We realised it’s just about paying attention. We bought mushrooms and mechanically put them in the bag provided. Why? Not sure. Now we just put them into the shopping trolley and add them as last item on the conveyer belt at check out. It’s all these small things that we just never thought about. This is what we still buy packaged: nappies, baby wipes, tissues, toilet paper. Some cosmetics such as make-up and powder as well as toothpaste. We have yet to locate recyclable (bamboo) toothbrushes. WE HAVE CUT DOWN OUR RUBBISH BY 2/3. It’s an overwhelming result, and it was absolutely painless. The switch was so easy, I can’t believe we didn’t do it earlier. What’s your approach? Do you have any tips to share? Hi Andrea. If you’ve got a Harris Farm supermarket near you, go check them out – they now stock bamboo toothbrushes and similar eco products. I’ve been buying them for years from health food stores and open-minded pharmacies, too. Another tip is to purchase Indian vedic tooth powder instead of toothpaste because 1. the containers are reusable 2. the product is environmentally sound and 3. one pot lasts around 2 months per person (a lot longer than a tube of paste). Thanks, will do. I love the thought of tooth powder but never actually tried. Definitely on my list now! Fantastic Andrea. Can I ask how do you package things at the bulk store? Do you pre-weigh your jars before filling them? Fantastic effort Andrea, what a great project. Very inspiring! Thanks for your encouraging words! The interesting thing is that it doesn’t even feel like we’re making an effort. The switch was actually super easy, I had just never bothered looking into shopping alternatives (even though I was surrounded by them!). Well done – it sounds as if you’ve made huge steps in zero-wasting your home! I too am a huge fan and admirer of Bea Johnson but – so far – haven’t made as much progress as you have in achieving a zero waste lifestyle! Small things we can all implement in our lives! Good stuff! I’m in the process of doing this too! Brilliant Andrea – I thought I wasn’t wasteful too – but there’s always ways to improve!